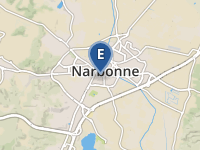 LE CENTRE HOSPITALIER DE NARBONNE RECHERCHE UN(E) CONTROLEUR(se) DE GESTION A 100%. POSTE A POURVOIR AU 02/01/2019.BAC +3 +5 EXIGE. DIPLOME EXIGE : LICENCE MASTER CONTROLE DE GESTIONS DES ENTREPRISES ; LICENCE MASTER CONTROLE DE GESTION ET AUDIT ; ECOLE SUPERIEUR DE COMMERCE.